A chip butty, a sandwich made of French fries, is a food phenomenon that could only happen in Britain where the humble spud is a food group all its own. Every country seems to have its own versions of "heart attack on a plate" foods and Britain is no exception. One of these may be the chip butty. It's basically a sandwich of french fries, or chips as they're called in the UK, between bread slathered with butter (thus the name "butty"). The humble chip butty is so deeply embedded in English lad and laddette culture that there is even a song about it. The song, known as the "Greasy Chip Butty Song" is an anthem sung by fans of the English football club Sheffield United to the tune of John Denver's "Annie's Song." Have a listen. To sauce or not to sauce? Crispy chips or floppy ones? Sliced bread, crusty rolls or buns? The recipe for the perfect chip butty, like recipes for other favorite classics like mac 'n cheese, is the subject of much serious discussion and disagreement - so much so that even the august London newpaper, The Telegraph, has weighed in with its own version. Softened salted butter, thickly spread on plain, cheap white bread. Don't hold back. If you are worried about fats and and calories, why are you eating this sandwich anyway? Cooked chips (french fries) The chips should be fluffy on the inside but pale on the outside. If you are clever about deep fat frying and can make twice cooked chips at home, go for it. But really, this is an impulse sandwich that you can make from good quality frozen fries or, best of all, fresh hot chips from a local takeaway shop. Salt, liberally sprinkled on the hot chips. Coarse, kosher or sea salt is best. Sauces (optional) Purists find the hot salty chips and buttered bread enough but some people add ketchup, HP Sauce or melted cheese. Construction - Aficionados insist that it's important when you put your sandwich together to arrange the chips neatly in two or three layers, each layer perpendicular to the one under it. You want to make a tightly packed, crosshatched arrangement. This, apparently has an impact on the taste. Breakfast, lunch, dinner? Basically anytime you can suspend your healthy eating concerns and enjoy guilt-free indulgence is a good time for a chip butty. They're especially good at soaking up alcohol after a night on the town, which makes them the ideal midnight snack - eaten standing up of course. 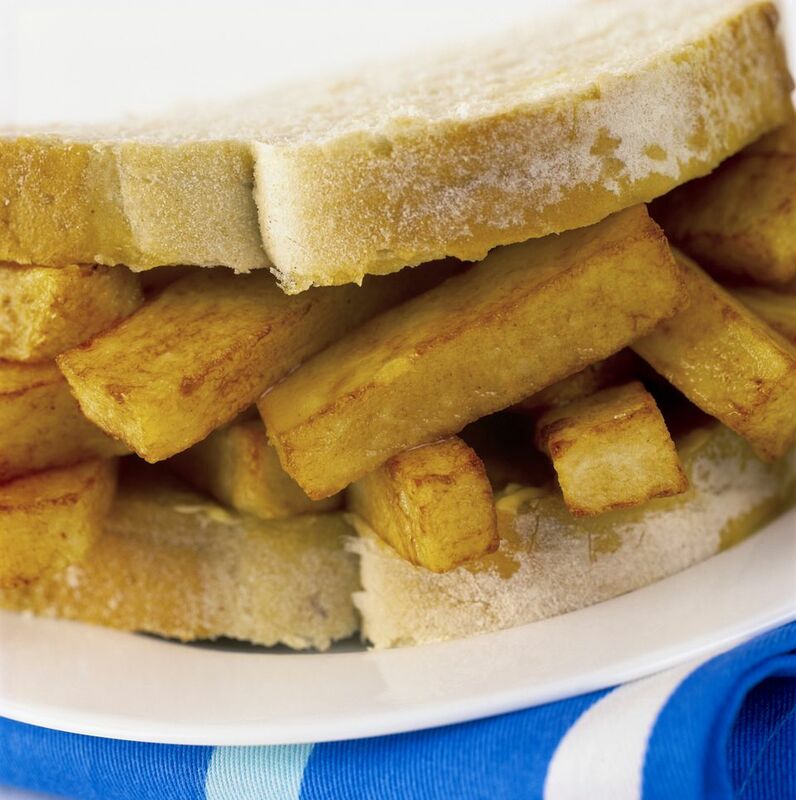 Another variation on potatoes between slices of white bread is the crisp sandwich or sarnie. Crisps in Britain are what North Americans call potato chips (remember chips in the UK are french fries back home). These - potato crisps doused with sauces on white bread (yes, buttered of course), are so popular in some quarters that recently, two different crisp sarnie cafes opened in the UK. The first, in Belfast, was a pop-up cafe that closed after a few months. The second, which opened in Yorkshire in 2015, was apparently a roaring success before the owner was forced to close because of his health.If you're thinking of trying a crisp sarnie, check out the BBC's recipe. Chip butties are most popular in the north of the UK and in Scotland. Not too surprising actually, since they also enjoy that other artery clogging treat, battered and deep-fried Mars Bars. But, before you turn up your nose in disdain at these weird, unhealthy combinations, consider the banana and mayo sandwich eaten for luck by the Washington Nationals baseball team. And, of course, there's always the fluffernutter.